While Pip went for a short jog around the neighbourhood to loosen the legs from the long drive, I headed to the local IGA, probably the closest supermarket to the start line. Unfortunately they were sold out of Bananas (I should have learned this lesson by now). I bought Pip 2 presents for driving me down…. A jar of pickles (for the cramp-crushing benefits of the pickle juice – This will be a post soon to come) and a bag of Dutch Syrup Wafers, one of my favourite ‘endurance foods’ and a popular choice for cyclists in Europe too. At 4.45am on Sunday Morning, I found myself in bed eating a Banana – It must be marathon day. I reluctantly forced myself to down 2 slices of PB on toast and a chocolate powerbar on top of the banana, got dressed, and Pip and I, along with our support crew, walked the short distance across the park to the start line, where we found the other Strider girls, some of which were doing the full, and some the half marathon. 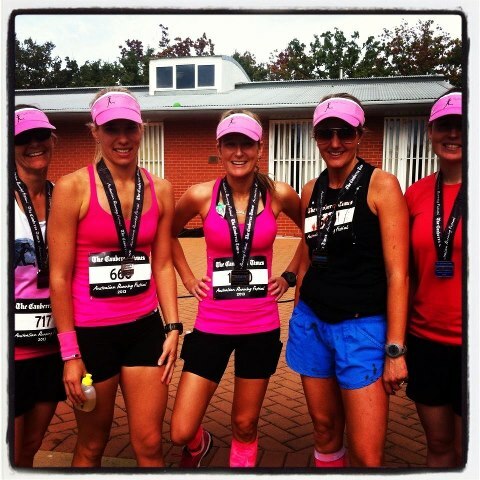 All of us had different goals, some were doing their first full or half marathon, and I was hoping to do a qualifying time for the 2014 Boston Marathon. For my gender and age category, the ‘BQ’ (Boston Qualifier) is 3 hours 35 minutes, 27 seconds faster than my personal best time, which I achieved in the Sydney Marathon last year. To get this, I had calculated I would need to run close to an average of 5 minutes 6 seconds per kilometre. I was planning to achieve this in the Gold Coast marathon this year, as I had not been training specifically for Canberra. 2 Days earlier, I decided that I should have a go at getting a BQ in Canberra, because I’m currently not injured, and had worked hard for the previous 3 months to get my endurance levels to the best I feel they have ever been, so why not have a crack at the BQ? In Canberra, both the half marathon and the full marathon runners start together at 7am, from the same marshalling area. I am still unconvinced that this is a good idea. The starting area was VERY congested. We were there early, and struggled to even get into the starting chute. I wanted to be up next to the 3 hour 30 minute pacer, carrying a silver helium balloon, but could not get anywhere near him. It was very frustrating that slower runners were pushing into the chute, and not seeding themselves correctly. My advice to the race organizers would be to please manage the start better! A larger are so people could seed themselves better, or separate areas or starts for the 2 different distances. The result of this congestion was a very slow start to the race. It took about a minute to make it across the start line, but then it slowed more. I was running with my Endomondo sports tracker set to beat the time I did in the Sydney Marathon, so it gave me progress updates at every kilometre whether I was in front of or behind my Sydney time. At the end of the first kilometre, I was about 30 seconds behind where I wanted to be – I had some work to do to make that time up! Up ahead, I could see the silver balloon of the 3:30 race pacer bobbing above the crowd – I made a mad dash weaving through the crowd to try and catch it. As I neared, I was crushed to see that it was actually the white balloon of the 4:15 pacer! I was even further behind than I thought. I struggled for the next few km to find a comfortable pace and stride amid all of the congestion. I tried to look ahead and see which way we were turning with every turn, and run the inside corners – This can take up to a few hundred metres or more of the overall distance in the marathon, which can equate to a few minutes, so for me, running the shortest distance possible was very important, as every second counted! At about the 7km mark ! seemed to get into the groove, and lost track of the distance I had completed. When I thought I had done 8 km I was pleased to see the road marker said 9km, and again when I thought I was at 12km I was actually at the 13km mark. At around the 16 km mark, I could see the 3:30 pacer up ahead… Great! The plan was to finish with him within sight, and I should get under 3:35. Canberra is a lap course, with 1 lap of ~10km, followed my two laps of ~15km. The advantage of this is that I got to see other runners I knew several times on the course. As I headed out to the turnaround of the 2nd lap for the first time, trailing the 3:30 pacer ‘ mother duck’ and all of his little ‘followers’ around him, I passed Al McCloskey on his return trip, looking strong. He gave me a yell and it lifted my spirits. I made it to the turnaround and started my journey back, pleased to see that Annalisa Moorcroft was not far behind, closely followed by Pip Cave, and then Kellie Smith. I headed back to complete the 2nd lap, and at around 25km, found myself next to the 3:30 pacer. Concentrating on running my own race I conpleted the 2nd lap, and let the pacer get ahead of me again. At around the 29km mark I was back in touch with the pacer and his followers, and, still running my own race, found myself in front of them. Worried that I was starting to fade, I downed some more salt tablets, and another GU gel. At around 32km I was running on a hill, but could not even tell if the slope was up or down, which worried me a little. My head was a little fuzzy and legs were feeling numb. I struggled to pull out my caffeine tablet and down it, as my hands were shaking, I was so worried I was going to drop it, but managed to get it down. At the turnaround, which was a hairpin turn, I turned too sharply and got an instant stabbing cramp down my left calf. I tried to run it out, as I downed my last gel faster than I have ever downed a gel before. A little while passed before I saw Annalisa and Pip, now running together, and Kellie slowly closing in on them, about a minute behind. Then, up ahead, I saw the 3:30 pacer in front of me. How did he get back in front? I didn’t see him pass me. This started to play on my mind, until I realised all of his ‘little ducks’ had dissipated, and he was running by himself. Had something happened? was the group still behind me? I saw the portaloos nearby, and wondered if the pacer had stopped to use them. It also would not be the first time a pacer has hit the wall in a race, and had to leave his group. With about 5km to go, I was really starting to struggle. I kept telling myself, ’5km is just one parkrun’ but the cramps were really starting to set in. Usually I experience dull, achy cramps in my quads and hammies. Tolerable if you just try to run through it. But today, it was the sharp kind of cramps in my calves that grab on and don’t let go, the kind that all of a sudden make you do the ‘sideways crab’ and collapse into the gutter. With 3km remaining, I consciously altrered my running stride to more of a heel strike. Poor form, but it seemed to relieve my calves a little. I battled to keep running, knowing that if i broke into a walk right now I would probably still scrape under by target time. I was out of water, gels and staminade, and feeling very dehydrated. I asked random spectators if there was a water stop ahead, and was assured there was one soon. 500m later I could still not see anything, and considered asking random strangers for water. Finally I found a station, and in my haste to get some fluid down, I poured a cup of sports drink all over my face. Sticky. With 1km to go, the end was in sight, and I was cheered on by Pips family, which lifted me, but not for long. They took the above photo of me at this point, and I was hurting. I felt like I was hobbling towards the line, and was pleased to turn the final corner and hear the announcer and crowd cheering home the runners under 3:30 gun time. I crossed the line in 3 hours 28 minutes 2 seconds , well and truly a BQ, and a PB by 7 min 25 seconds, 27th Female out of 353 Entrants, and 6th in my age category. I was on a high as I waited on the finish line with Georgie, who had just completed her first half marathon, as we cheered the other strider girls home. Kellie Smith was certainly a sight to see, covered in blood as she arrived home. She had taken a tumble not far from the end, and went chin first into the pavement. With adrenaline pumping, Kel said she barely even felt the injury, and just wanted to keep on running when the St Johns Ambulance staff were making sure she was OK. 3 stitches later, Kel is now looking forward to her Wild Endurance 50km event in 3 weeks time. Vlad Shatrov – 2:25:22, 2nd overall, winner of the 50km ultramarathon! (OK, not a novocastrian, but we will claim him as ours, as the partner of the lovely Cheryl, who I dearly miss training with – Congratulations Vlad! Victoria Bonsor – 3:29:42, Overall 32nd Female and a BQ for Victoria! Pip Cave – 3:53:25, A phenomenal first marathon from Pip, and 17th in F 20-29! 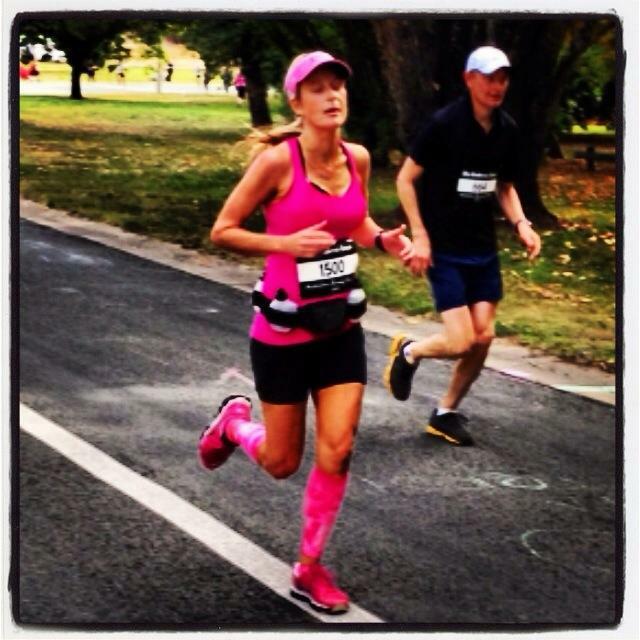 Annalisa Moorcroft – 3:58:14, a great achievement under 4 hours! Dave Cave – 1:33:14, Great result, lives in Canberra, is Pip’s Brother, and was a great host for the weekend. Kara Booth – 1:51:25, Kara did a negative split! Great achievement. Georgie Garr – 2:16:42, a great effort for her first shot at this distance. It was great to see Georgie out running on the course! Apologies to any other Newcastle runners I didn’t mention, It’s probably because I don’t know you. Feel free to post results in the Comments section, and hope to see you on a run soon.